We were visiting my son in America the other week and he and his wife told us how they had taken the Special K Challenge* and had both lost a significant amount of weight (as if they needed to; she’s a marathon runner and he’s an ex-marine and still in prime condition). This diet involves having Special K for breakfast and lunch, and a light, nutritious meal for dinner, for a period of two weeks. I noted that I liked Special K and often had it for breakfast, so it would be an easy diet for me. The next thing I knew, after landing back in the UK, my wife and I had bought two big boxes of the cereal and I was putting my money where my mouth was, so to speak. I don’t mind, really. As I said, I like Special K, so having it for lunch isn’t much of a change and having it for breakfast is no change at all, which is the problem. After a week, I haven’t lost an ounce and have, in fact, gained weight. 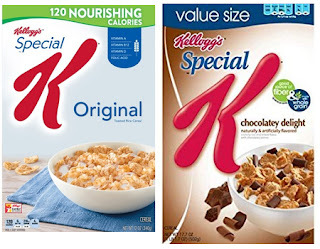 Original Special K rather than the Chocolate Delight Special K. Just sayin'. For the record, my wife and I are not fans of fad diets. I’m pretty comfortable with my weight, and I am bang on the Normal range on the BMI chart, as long as I record my height while standing tip-toe. The only reason we went on this diet was that it seemed an easy win, and I would like to put a crimp in my weight-gain trajectory. When I was in my twenties, I weighed one-hundred and twenty pounds, in my thirties, I weighed in the one-thirties, and so on. As you can see, comfortable with my weight or not, I have concerns for the future, so dropping ten pounds would be a welcome reversal. I look at it as future-proofing my weight. I do not, however, hold out much hope; I think I am destined to weight as much as I do and there is very little I can do about it. Weight is a direct result of calorie intake versus activity. My wife and I are well aware of this, so rather than diet, we traditionally seek to decrease our calorie intake and increase our activity. To this end, I have—over the years—stopped taking sugar in my coffee and gave up having a chocolate biscuit (cookie) with my nightly cup of tea. We have also cut down on the number of times we go out to dinner, from several times a month to special occasions, and instead eat healthy, balanced meals at home (my wife is a vegetarian, so we eat a lot of couscous, lentils and rice, which is not a problem, because I like couscous, lentils and rice; but unlike my wife, I also like bacon burgers, meatloaf and sausage rolls). Lately, I have stopped ordering muffins to go with our cups of tea at the café and, when we go to the cinema, we don’t buy any treats to eat while watching the movie. I know that doesn’t sound like much, but on a whole, that takes a big bite out of our monthly calorie intake, and coupled with that, we are increasing our activity. And do you know how much weight all this self-denial has helped me lose? Absolutely none. In my mind, it would be better to keep all those treats and just remain at my current weight. But we are where we are, and that is in the middle of our fortnightly experiment with Special K. I have fourteen more bowls to get through before I can return to bacon burgers, meatloaf and sausage rolls. This is, as long as I don’t gain too much weight on this diet. The Special K Diet: your millage May Vary. enough (I hope) to avoid copyright infringement lawsuits. * Special K, Kellogg’s Cereals or General Mills have not paid me for endorsing their cereal or promoting the Special K Challenge diet, nor have I written this post in exchange for products. And I’m a little bit miffed about that. I don't commit any of the sins you mentioned (biscuits etc.) but have gained weight recently. I'm getting a lot of mileage out of terrible back problems, surgery and its failure, but it could also be the evil Pinot Grigio. Sigh.